QED Performance Audio 40 review | What Hi-Fi? When we surprise ourselves, it’s generally because we’ve done something exceptionally stupid. Not QED: it has done so with how well it’s able to make interconnects. “Our extensive listening tests comparing it against competitor products at much higher price points have astonished us,” its website says about the Performance Audio 40. 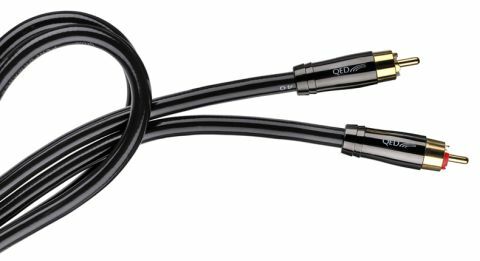 Lavishing praise upon oneself does not a good cable manufacturer make, as they say, but QED has at least built this one to play the part. The Performance Audio 40’s floating internal ferrite jacket, QED claims, absorbs high-frequency noise outside the audible band that can affect timing and disrupt signal flow; its Anamate RCA plug, a variation of the Analoc RCA plug found on the more pricey Reference and Signature Audio 40 interconnects, is designed to reduce meddling, swirling ‘eddy currents’ (loops of electric current caused by a changing magnetic field in the conductor); and its pair of 99.999% oxygen-free copper conductors an alternative path for high-frequency components that might again otherwise affect timing. We connect the Performance Audio 40 with our reference system and begin playing Frightened Rabbit’s Pedestrian Verse. From the opening piano chords of Acts Of Man we are impressed with the space and cleanliness the QED offers our system. That piano creates a platform for Scott Hutchinson’s voice to sing on a seemingly ceiling-less soundstage. As percussion and guitars build, they are separate but not estranged. There is an organisation that keeps the instruments in this cavernous soundscape tied together as an ensemble, rather than feeling like a series of soloists. That soundstage is wide-open vertically as much as it is horizontally. It helps vocals sound full-bodied and weighty, but with lots of breathing space above them, too; essentially it is more natural sounding. That cleanliness applies when down low, too, with agility and surefootedness applied to that solid low end. There’s great expression in the sound too, dynamically and rhythmically. A track such as Holy, more forcefully driven and more intense, is allowed its urgency without missing the apathy of Hutchinson’s self-deprecating lyrics. There’s a great juxtaposition, as is part of the band’s signature, between the song’s theme and its buoyant accompaniment; the Performance Audio 40 doesn’t let our system allow its analysis get in the way of expressing that musical conflict. Nonetheless, when it does get truly downbeat, such as with Nitrous Gas, it is suitably aching. QED’s direct competition here is Chord, whose C-Line interconnect won the category at the 2015 What Hi-Fi? Awards. Switching between the two, our reference system doesn’t have the same space or detail using the C-Line; it is marginally more closed in, but the music tends to knit together better. We aren’t saying the Performance Audio 40’s sound is anything like sterile, but it has a more analytical approach than the Chord, which tends to focus more on musicality. The beauty is that, for less than £50 per metre, we have available two exceptional interconnects with differing talents depending upon your preference and/or the rest of your system. If you covet space and detail with sure but nimble footwork and heaps of insight, consider your search complete.